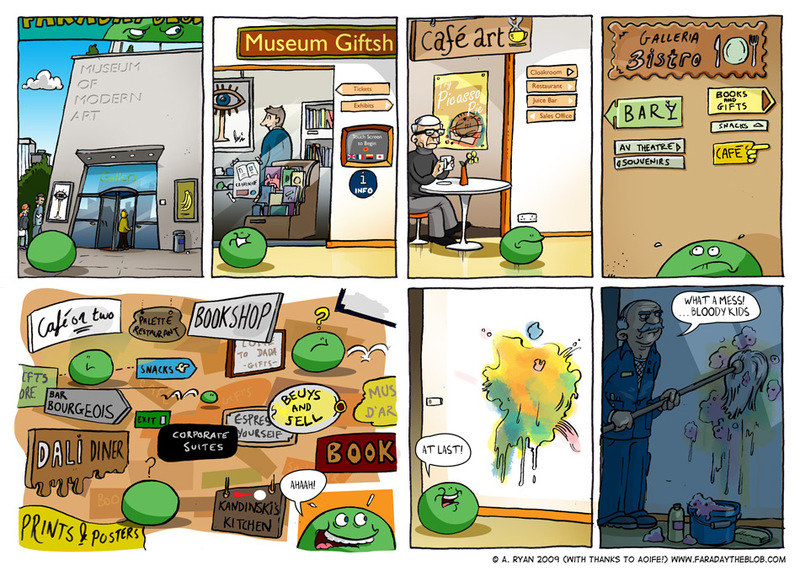 This is based on an almost true story… We visited an art gallery last year where we actually had to forage to find any actual art, but were presented with many cultural retail opportunities. Thankfully I am very much pro-cake – outlets for which were abundant – so all was well in the end! This entry was posted on Friday, April 17th, 2009 at 7:00 am and is filed under Comics. You can follow any responses to this entry through the RSS 2.0 feed. You can skip to the end and leave a response. Pinging is currently not allowed. Wow! Seems like this was one hard work! The story on the comic was realistic in some ways. I may have thought that the story was based on experience which is actually surprising. I find it amusing that going to Art Gallery now a days can be that boring because a lot of those presented in the gallery are rubbish.